Haptic Slider is an experiment that explores movement, response, and time through the use of soft sensors. The slider measures the motion and position of a finger along a sewn path. As the finger moves along the path from left to right, the intensity of the vibration motor increases accordingly. The haptic response creates a dynamic experience; instead of engaging with a dial to control a vibration the user can feel and set the intensity to their liking through the initial contact with the path. The finger becomes the controller and mimics user experience patterns learned on touch devices. The Haptic Slider takes digital patterns that create depth in devices without any and implements the patterns on physical tactile surfaces to give the user a sense of control. For this project, I was inspired by common user experience patterns that are learned through touch devices like our smartphones. Many of those user experience patterns create space on surfaces where there is visually nothing more than a screen. I wanted to explore how to apply these motions we have learned (such as sliding a volume control down) and apply them onto a surface where depth cannot be changed visually. 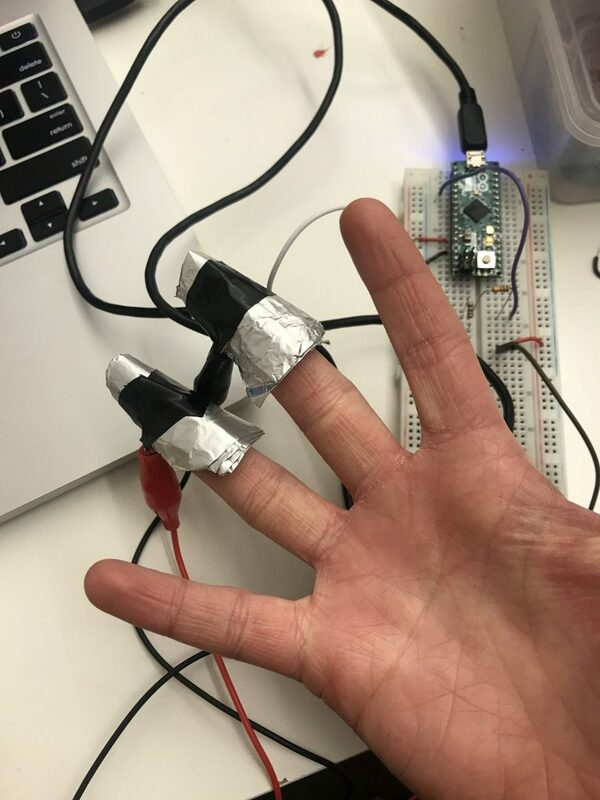 My experiment is to explore what could this haptic response create when the user performs the action of sliding a finger up and down on a soft surface. The first instinctual action that I wanted to perform was the act of a finger moving up and down a soft static slider. 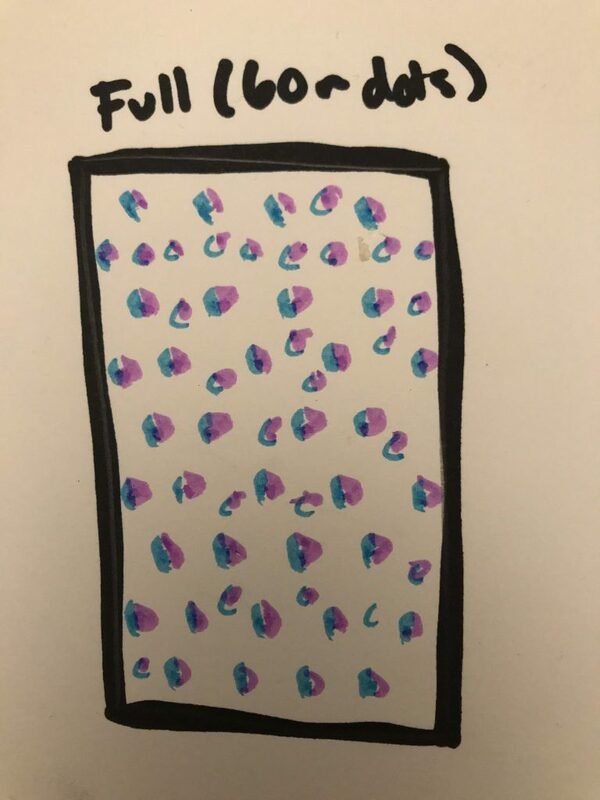 I drew out a brief sketch of what I wanted to achieve. 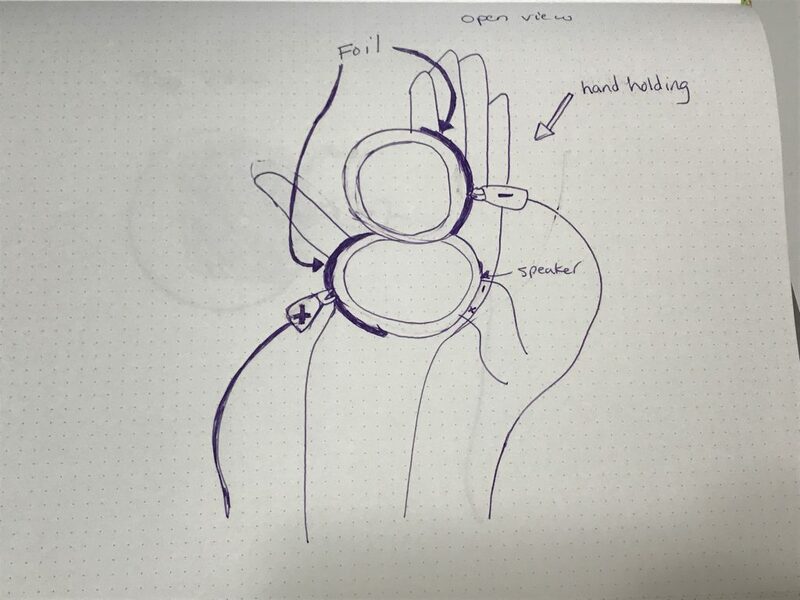 Initial sketch of the Haptic Slider. Upon looking at my sketch I realized that what I really wanted was a physical potentiometer. I went to How to Get What You Want and explored the tutorials. 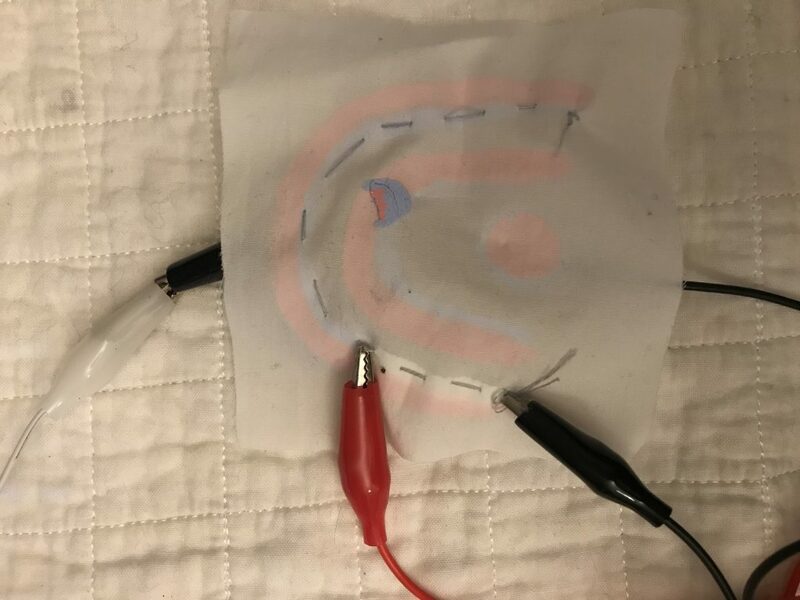 I found a fabric potentiometer that used resistive material, conductive fabric, and conductive thread. Screenshot from How to Get What You want of the diagram for how to construct the soft potentiometer. To follow the tutorial, I decided to change shape of the slider pattern to match the design that they had created. 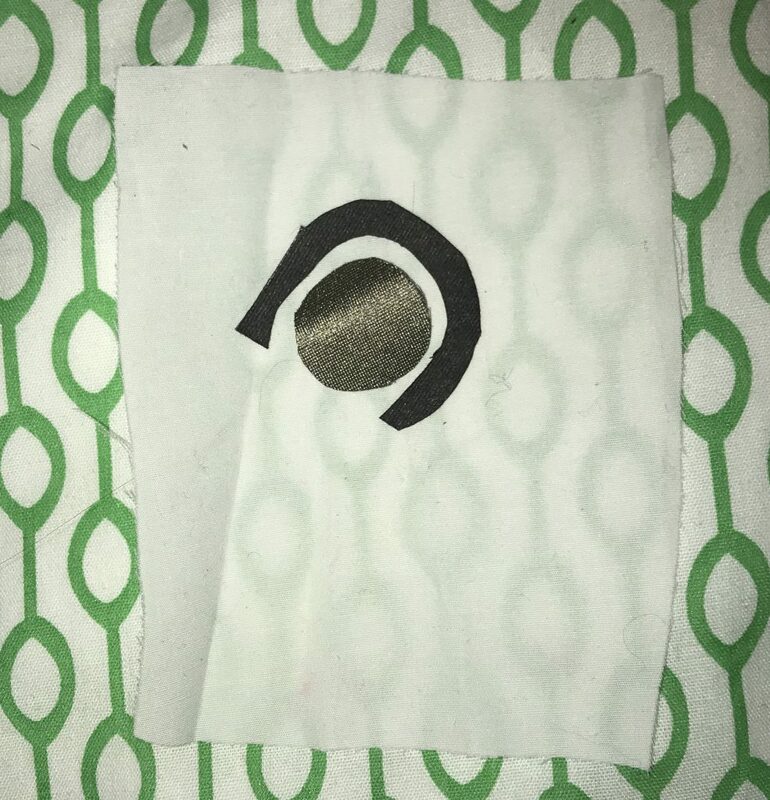 I chose to use Eeonyx Pressure Sensing Fabric resistive material that is used in a pressure sensor as an experiment. 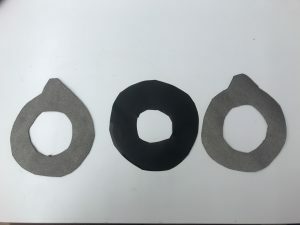 The inner circle is conductive fabric and the outer ring is resistive material. 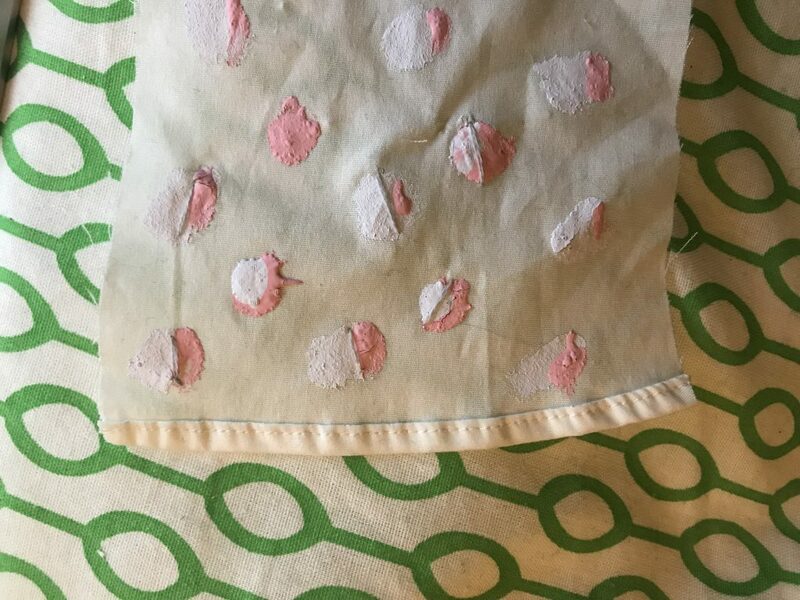 I chose to sew these pieces onto a piece of non-conductive fabric for stability. I used alligator clips with male headers to connect the two pieces of material to my breadboard. I then took a small piece of scrap conductive fabric and moved it along the dome-shaped path of the soft potentiometer. I uploaded the example code analogInOutSerial to read the differences in values. The soft potentiometer connected to power and ground. Initially, I was receiving a reading between zero to three. I swapped out my 10k resistor for a 1k and found that my range ranged from thirty to three hundred as my piece of fabric moved along the edges. Satisfied with the outcome, I decided to connect a vibration motor to the circuit. Vibration motor connected to power and ground using alligator clips with male headers. I initially tried to map the value of the sensor to the output value of the vibration motor. I found this ineffective because the motor only really triggered a vibration when the output value was greater than 150. Because I wanted a steady gradient of vibration as someone’s finger travelled along the path I chose to not use this method. 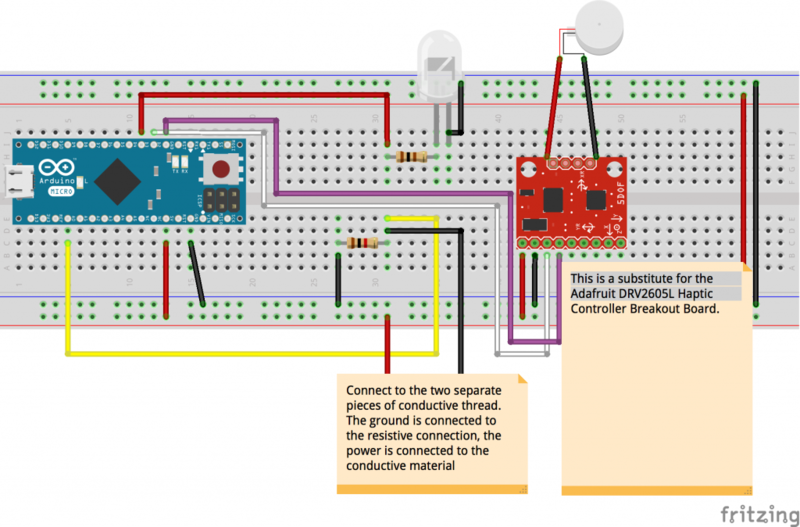 I uploaded the example code for the Haptic Controller Breakout Board. 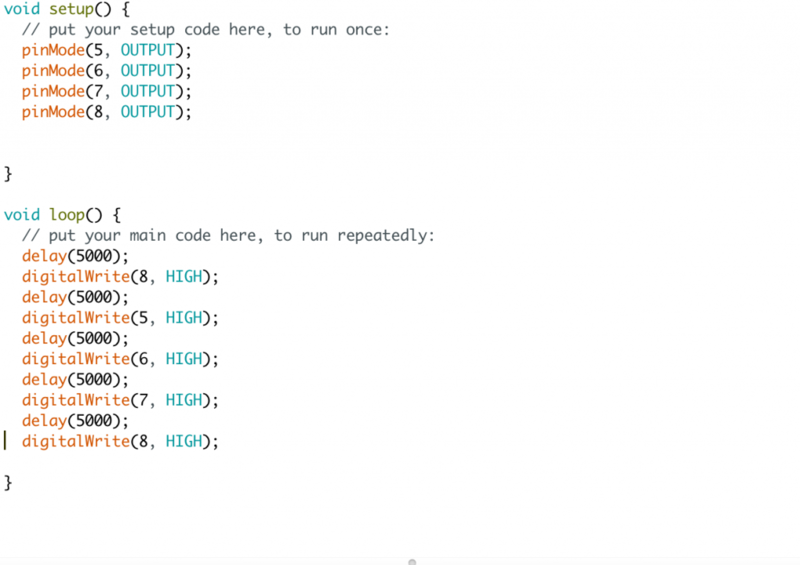 The example code cycles through all of the patterns that are available in the library. I held the vibration motor until I felt a gradient of steady vibrations go from either high to low (or vice versa). The serial port was printing out the number of the example as it was executing the associated code. After a couple of loops, I identified some key pattern sequences that created a steady decrease in vibration. In addition, on the documentation for the breakout board is included a pattern list. 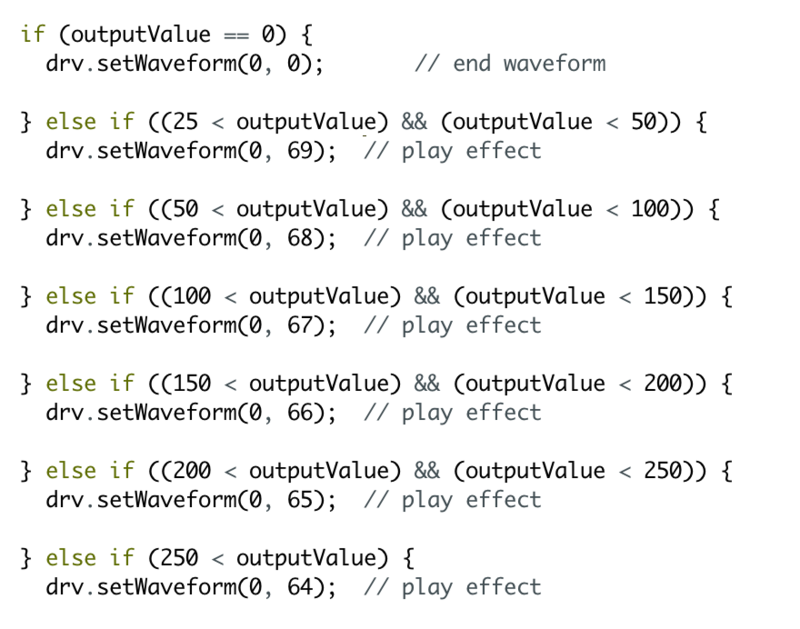 I found the specific pattern numbers and isolated the code to loop through those. Screenshot from the Adafruit documentation of the settings I used for the vibration motor. My next step was connecting the potentiometer and the pattern library. 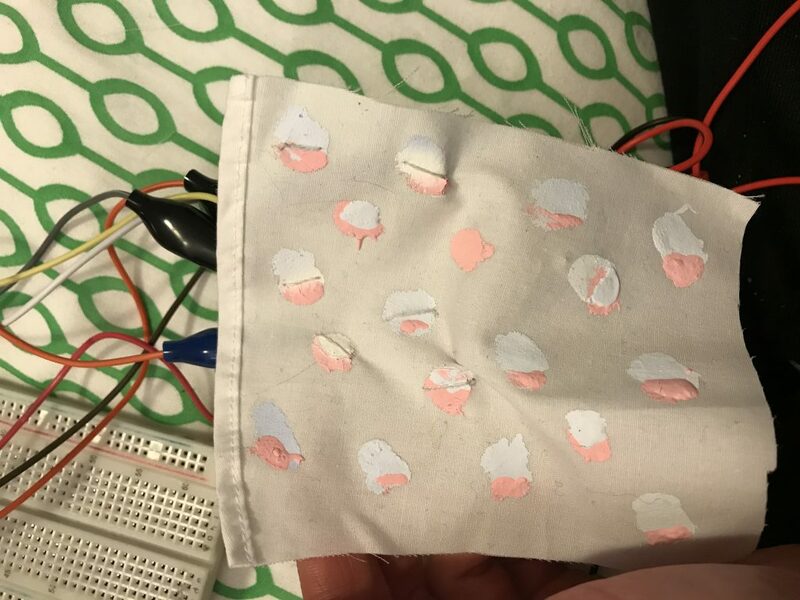 Through my initial testing, I found that the potentiometer rarely exceeded 300, and the lowest value was 0 when there was nothing touching the fabric. Mapped values from the output to the vibration motor. 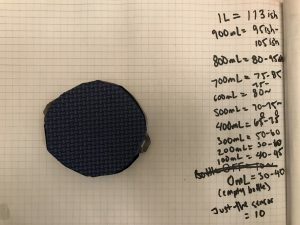 I created case statements that would determine the increase or decrease the intensity of the motor depending on the analog value from the fabric. Case statements to determine the gradual increase or decrease in the vibration motor intensity. I found that this was simple and effective, but I had an issue when the value was not consistently zero. If it was not consistently zero, the motor would often “glitch” on and off. After testing again, the initial value of touching the sensor at the farthest edge was thirty, so I decided that if the output value was below twenty-five to set the value to zero. Arduino code that sets the value to 0 if the incoming reading is below 25. This is to stop the vibration motor from flickering. 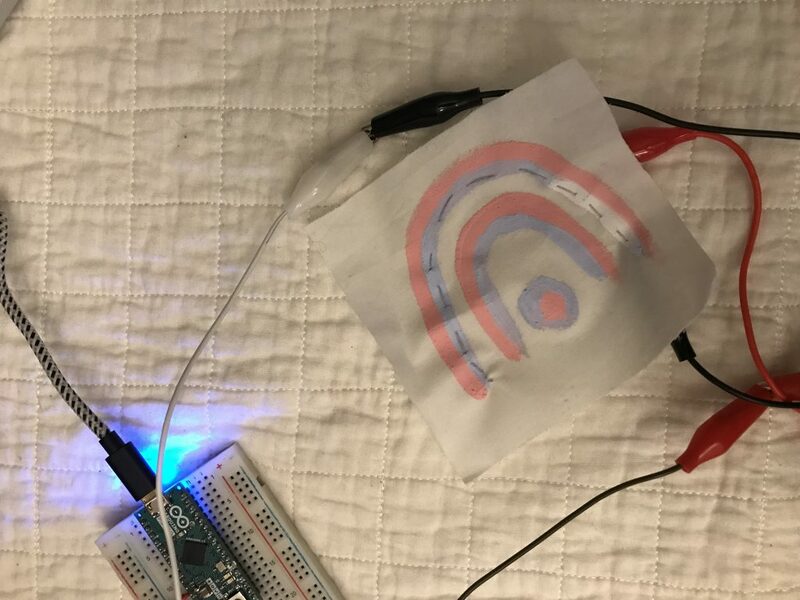 For documentation purposes, I included an led light on the circuit to visualize the motion of the someone tracing their finger along the path. Soft circuit all assembled. 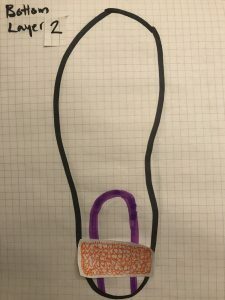 An LED light is included in the circuit using conductive fabric to give visual feedback for documentation. 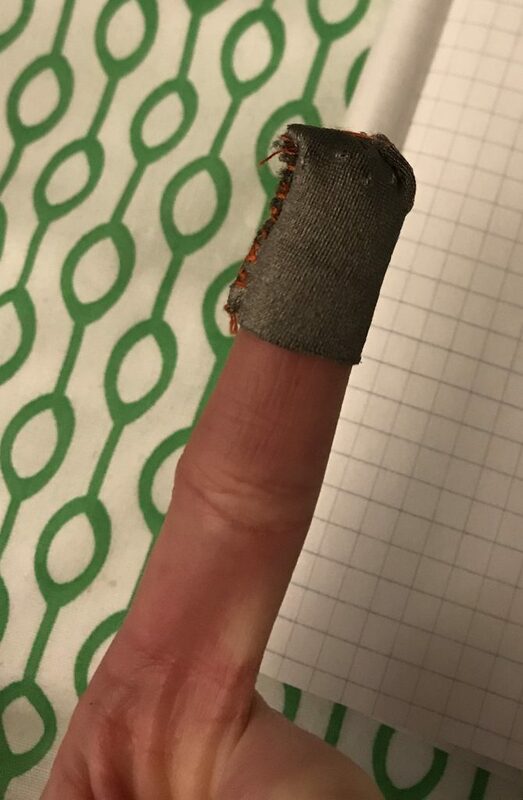 I sewed a finger cover out of conductive fabric rather than fumbling with a piece of scrap conductive fabric. Finger slip made out of conductive material that is used to interact with the potentiometer. 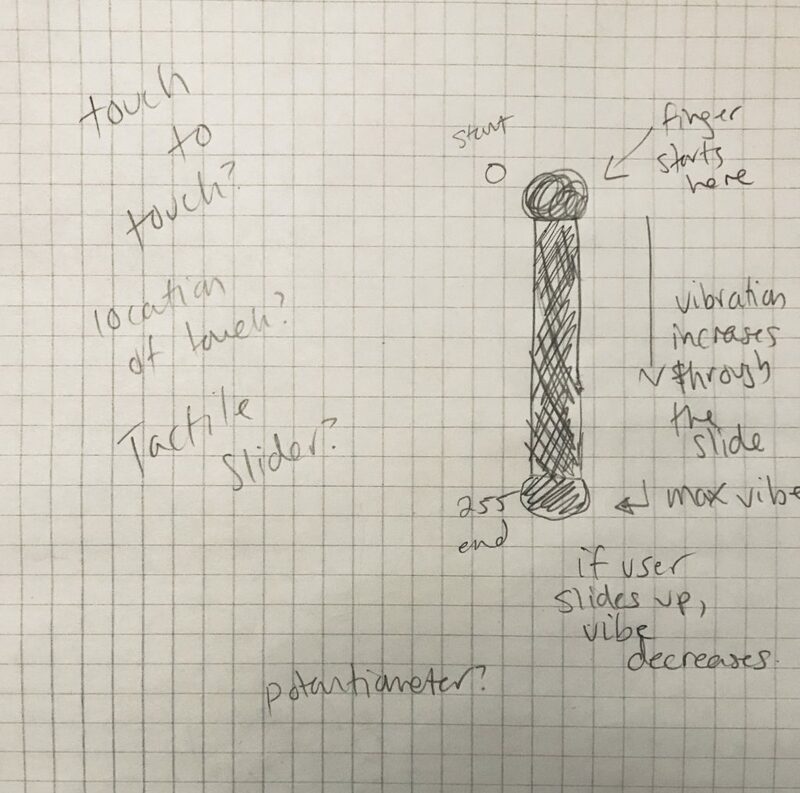 Connection diagram for haptic slider. The potentiometer gives accurate haptic feedback that correlates to the position of interaction on the path. The interaction is a very one to one result. Once the user takes away their finger all elements of interaction immediately stop. The result is no longer a tactile controller but a response to the interaction the user is engaging within. Wherever the user places their finger will dictate the intensity of the vibration. In the next iteration, I would want to make the slider have a memory and work more like a tool. The user could slide their finger along the path to dictate the level of vibration and once removed the vibration would stay at the last indicated intensity. I really enjoyed the design as the shape mimics a gauge, similar to that of a speedometer. The visual connotations work well with the response and haptics of a vibration motor. In this design, the vibration motor is visibly separated from the potentiometer and the sewn together base material. To create a more authentic haptic experience, the vibration motor would be placed beneath the potentiometer to give a hidden haptic response. Currently, the visual of the vibration motor is an initial indicator of the intensity as the user interacts, but ideally the user would choose an interact with the tool solely using touch. The other visual indicator that is in this circuit is the LED. This could be removed in future iterations. Currently, it is included for as a visual reference for documentation. The user is required to use a piece of conductive material to connect the potentiometer pieces together. 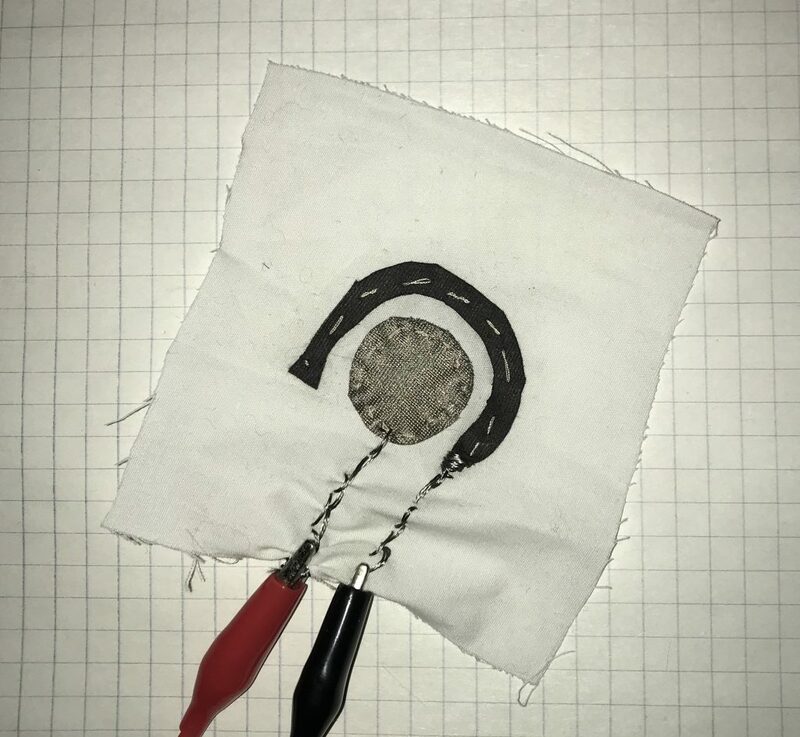 On How to Get What You Want, there is a demonstration of a potentiometer that uses metal pieces on top of conductive and resistive fabrics. I was tempted to explore this tutorial but I disliked the concept of having to move something physical on top of the potentiometer for this iteration. 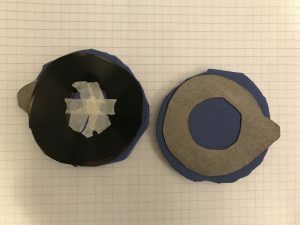 Ultimately though, it is necessary to connect the two pieces and I chose to sew a finger covering to attain the “magic” of the finger being what controlled the potentiometer. Overall, I really enjoyed the simplicity and delicacy of crafting the soft potentiometer. Haptics is an interesting exploration because it borders what is simply a reaction and what is a reaction that gives the user meaning to their action. In common haptics we interact with, we receive information on depth and pressure. In this exploration, I aimed to see if I could explore both of these. 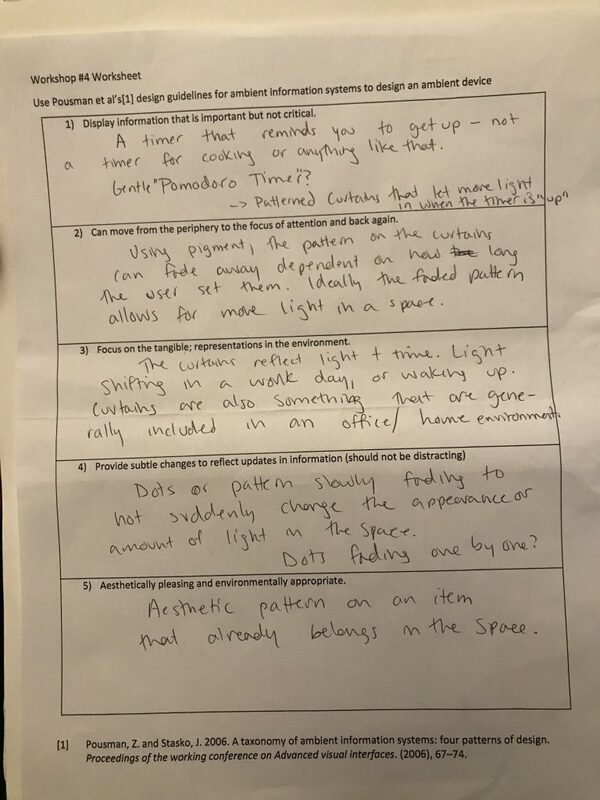 I am unsure if the one to one relationship that resulted in the interaction of moving a finger along a fabric potentiometer achieved either fully. The mapped interaction of moving the finger along the path to a vibration intensity could have used in practical products as a controller, but on its own, it is simply a calculated response. 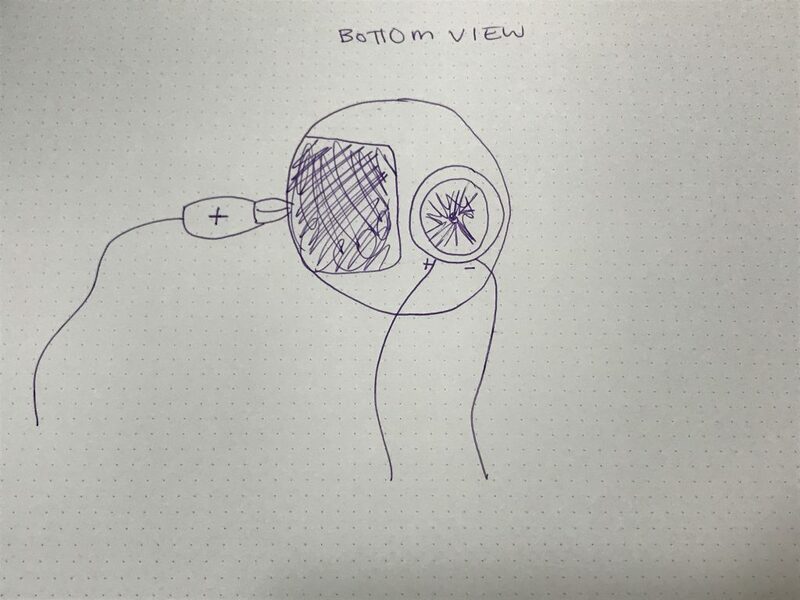 In a future iteration, it would be interesting to experiment with how this design could be embedded in other technologies to further explore the field of haptic response in body-centric technologies. Compact Tones is a compact mirror that responds to the user’s stress levels. The mirror gently hums when left alone and is activated by being held by the user’s touch. The mirror responds to the moisture on the user’s palms and correlates this to the tone emitting tone. The tone changes every five seconds unless the user is in extreme duress. If this is the case, then the tone will repeatedly alter until placed down. This device gives space and reflection through audio to bring attention and presence to the act of gazing at oneself in a mirror for an extended period. With this assignment, my goal was the create a self-reflexive experience on adjusting and looking at yourself in front of a mirror. I wanted to create a relationship with the mirror that is a non-visual experience to reflect on the act of engaging in an activity that was purely visual. The use of the compact mirror is to reflect the one on one relationship that we have with our own bodies. This project aims to highlight the act of habitually monitoring our own bodies and how one may use appearance as a coping mechanism when they are stressed. The range of the tones was selected to avoid connotations of irritation when the tone is too high or apathy if the tone is not present. The mirror is always gently humming, and the pitch does not exceed too high of a tone. This does not dictate or prescribe any standard of a norm as the tone is always changing slightly when by itself. When the mirror detects the user’s touch it alters to a chirp, as if it were having a conversation with the user. This allows the user to be in full control of the device and their part in the conversation, and motivation in using the device. For this project, I chose to use galvanic skin response as a method of bio-feedback. I chose this method because I wanted to measure the activity of someone holding a contact mirror. My first step was to test out the technique myself. I took two pieces of aluminum foil and taped them around my fingers to see if I could get a measure. I found at first that I was not getting a drastic change in numbers, but the more I tried I noticed my readings were increasing. This was an interesting experience as I was visually seeing the change through the readings as I was constructing the piece. Initial investigation of the sensor. My next step was to visualize how the aluminum foil would be placed on the mirror. As I needed two detached pieces of aluminum I decided to place the foil on either side of the packet. For the speaker, I decided to place it on the bottom of the compact so that the emitting tones would not be as blaring. Diagram of the compact mirror being held. Top view of the compact mirror assembly. Bottom view of the compact mirror assembly. After testing and sketching, I started to assemble my piece together. 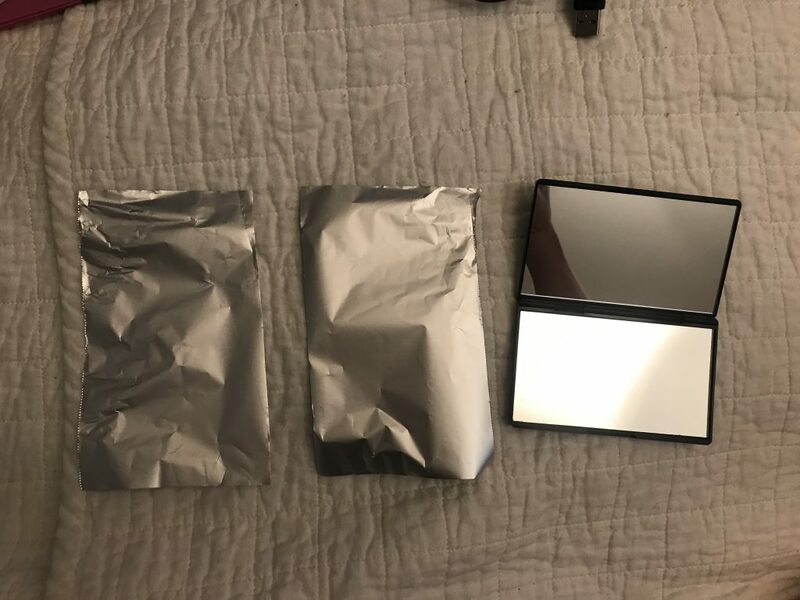 I cut out two pieces of aluminum foil roughly the size of each side of the compact mirror. I used electrical tape the secure the pieces down. I left two slots open on either side to allow for the alligator clips to clip into easily. Materials required for assembly of the sensor. I tested out the values with the compact. Similar to my first experience, I found that my readings were not significant until after a few times when my hands were actively moving and producing sweat. I then connected the speaker to the circuit and added in tones. Initially, I created an array with a list of tones that were in the order of a musical scale from low C to a high C. I did this so that I would have any obnoxious tones that would be distracting to the experience of the mirror. I then took the values of the compact mirror and mapped them to the length of the array. The outcome of the mapping would be an integer that would then be used to indicate what value of the array would be the emitting tone. Initially, the range of tones was distracting. When untouched, the mirror would emit a very low buzz, and then when activated the pitch would starkly change to a high whining tone. I then mapped the tones to go from a low to a mid-range pitch so that the interaction would be more musical and smooth. My next step was to include a time aspect to the piece. I did not want the compact mirror to instantly respond to palm because that would make the compact mirror more or a musical instrument rather than a tool for slower reflection. 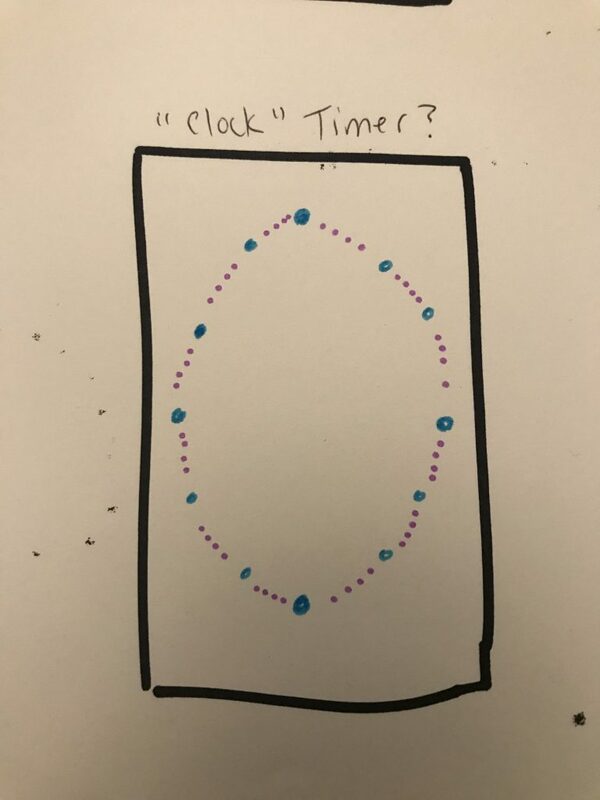 I chose to code the compact mirror to take into account the sensor reading in correlation to the time spent holding the mirror. For testing purposes, I chose five seconds as a time measure. 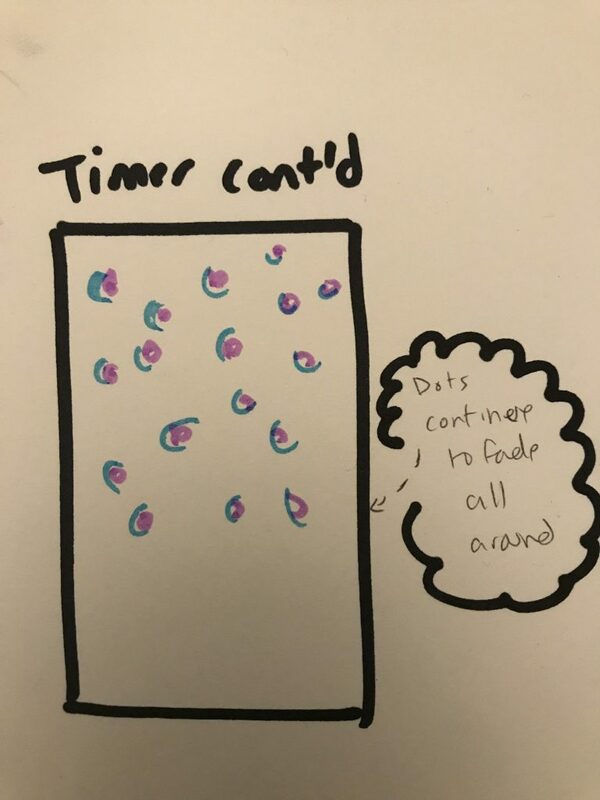 If the sensor value is over a certain threshold, and a certain amount of time passes (five seconds) then the tone scale would increase as a response. Once put down the tone would then go back to a lower tone. Demo of the compact mirror responding to being touched. Something I discovered as I was testing was that if the compact mirror was left by itself untouched, the tone would change every five-second increment. This was interesting and I chose to leave this as it made the experience of the tone changing when picking up the device a more natural and less judgemental interaction. Another discovery I noticed when testing was that once I removed my hand from the device the tones would “wind down” in the scale in quick succession. Once again, it seemed like it heightened the natural interaction of human to mirror and decided to leave the code untouched. The main challenge of this project was thinking of how to create a non-judgemental response when holding a compact mirror. Having a reaction to looking yourself in the mirror could be a very loaded action: it could be immediately judgemental, it could be stressful, or it could a deterrent from the action. My initial thought was to have LED lights to respond to the proximity of being in front of a mirror, but I thought that the light would interfere too much with the act of looking at your reflection. I ended up playing around with tone as an alternative but was also concerned with the connotations of tones. Such as: Would it sound too much like an alarm? Would it turn into an instrument rather than create a reflective space? These were my main concerns pursuing this output. I found that I did not a steady data set to work with using the aluminum foil. I thought that I would have a more gradual input of data, but it seemed fairly binary as I was working with the material. I also suspected the readings to be closer to 0 when the mirror was left alone but found that it was steadily around 200. Rather than calibrating the data set, I chose the threshold for the sensor to reflect a very high level of moisture on the skin (900 out of 1023), and for the lower inputs to be mapped to the tones so there was always the “hum”. I found that using a found object to be an effective foundation for this project. Placing the aluminum foil on the mirror and using alligator clips to connect it the breadboard worked well for testing. Beyond testing, this would be inefficient for a portable item. If I were to make a future rendition having all of the components together would be problematic. The aluminum foil on the compact mirror is flimsy and only attached by the edges. I found that the foil ripped easily when the mirror was moved around extensively. As well, the foil covers all of the surfaces. This would be problematic for attaching any microprocessors or protoboards as they would most likely to be attached to one of those surfaces. The components would either have to be wireless or the foil would have to be connected to accommodate to the hardware. In a future iteration, I would use recorded sounds rather than tones. I think the tones are playful but still come across as distracting and stark. If there were softer sounds that were less removed from the context of alarms the soma aesthetics of the interaction would give more space for reflection. Overall, I think that this project could be elevated to be used beyond compact mirrors. The inputs from the galvanic skin response sensors mapped to sounds could be applied onto many other items. The act of physical touch mapped to an ephemeral output such as sound creates space for reflection on many other interactions such as using a pen or typing on a keyboard. 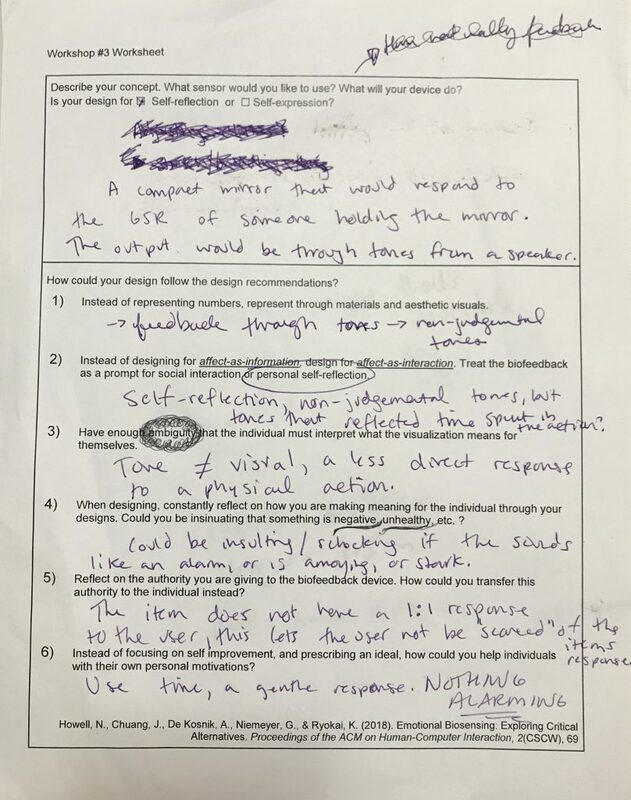 Galvanic skin response as bio-feedback is interesting because it can incorporate time – the data inputs can change over the time of the interaction. This project is only a small experiment in the greater potential of using the galvanic skin response in combination with sound as an output. This assignment directed us to test and get the readings from different types of conductive materials. We then took one of the materials and created a bespoke sensor that measured and calibrated to a body related action. 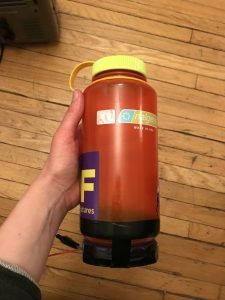 I chose to create a sensor that measures how much water someone has consumed from their water bottle. 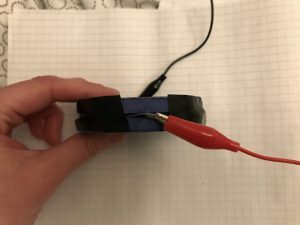 For the first step of this project, I and a few classmates measured the different materials in our conductive fabric kits using a multimeter. 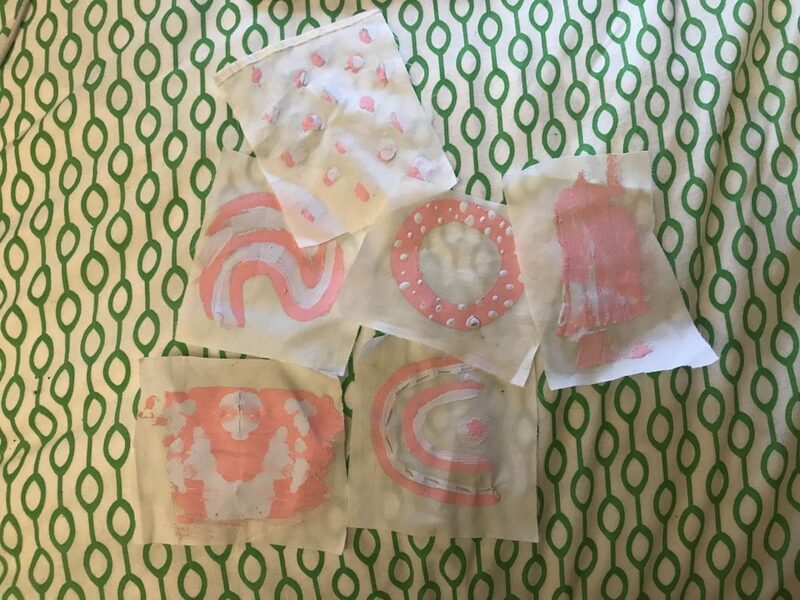 We tried to be as clinical as possible with the materials and let the material rest naturally after it had been activated. The only material we did not do that for was the fibre because we wanted to see the contrast between the fibres being spread out versus tightly scrunched together. 1 140000 ohm 126 ohm 200k (rest) – 200 (activated) This material seemed to have the resting values extremely high vs. the activated material. The sensor did not need a terrible amount of pressure to change. 1 44400 ohm 120 ohm 200k (rest) – 200 (activated) Similar results as before, but this material seemed to have a lower resting value than the other Velostat. The sensor did not need a terrible amount of pressure to change to a lower resistance. 1 50000 ohm 150 ohm 200k (rest) – 200 (activated) A large range of values! Found to be a bit inconsistent with the resting values. 1 145000 ohm 53900 ohm 200k resistance Did not need to change the resistance for this material; the range seemed to be fairly consistent. 1 12500 ohm 690 ohm 20k (rest) – 2000 (activated) This one was fun trying to scrunch it to as small as it could be. The range is quite large for this material as well. This material is incredibly responsive; a light touch changes the values significantly. For testing the Arduino’s we followed a similar clinical process: test the materials and let them rest naturally. Upon initial investigation, I was convinced that we had our setup incorrectly because the values upon activation were going up rather than lowering. After reflecting we realized that this made sense because the closer the sensors (especially the pressure ones) were together the closer the path is for the current. 1 20 1015 4.7k Will not go higher than 1023? Even with different resistors. The value would often go down to nearly zero. Inconsistent resting values. The sensor did not need a terrible amount of pressure to change. 1 95 1021 10k Same as above, will not go higher than 1023? Even with different resistors. The sensor did not need a terrible amount of pressure to change. 1 54 118 10k The resting values were inconsistent. The values of the rest vs. activated were always about half. 1 570 980 10k A large array of values! I scrunched this one very tightly. Just over double the value? Restart the timer and indicate to the user that they have consumed water. I chose to fabricate the pressure sensor out of the matte velostat, conductive fabric, and the floor foam. I chose those materials as I wanted to create a shape that takes an even reading from the base of the water bottle. There were lots of this material to take from, so I knew that I would be able to produce the size and shape to take the reading I wanted. My first step was to trace the base of my water bottle and cut out the shape of the sensor. The bottom of my bottle dipped in slightly at the middle, so I chose to use a “donut” shaped sensor that would only attach itself to the bottle’s points of contact with the table. 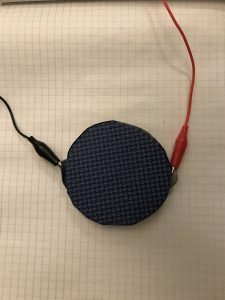 I cut the conductive fabric slightly smaller and included flaps for the hardware connections to have enough surface area to attach. Traced out cutouts from the base of my water bottle. Cutouts of the conductive fabric and velostat. My next step was to cut out the foam pieces and assemble the sensor. I cut the foam to be a bit wider than the velostat to allow for full coverage of the sensor. I was concerned that, because I was working with a device that carries water, there may be some potential for water to seep into the sensor. Assembling the water bottle sensor. Before I fully attached the sensor together, I tested the values. To my surprise, my values were vastly different from my Arduino testing. My range was from 10-250, rather than 0-1023. This worried me at first, but I chose to continue with the development of the sensor and see what I would be able to do with the incoming data. I attempted using different resistors to test the incoming data values. I found I had the best range using a 10k Ohm resistor. This was the same resistor that provided the best results in our initial testings. Testing out the sensor before assembling it together with an adhesive. After confirming that I was able to get a reading from my sensor, I used electrical tape to secure my sensor together. 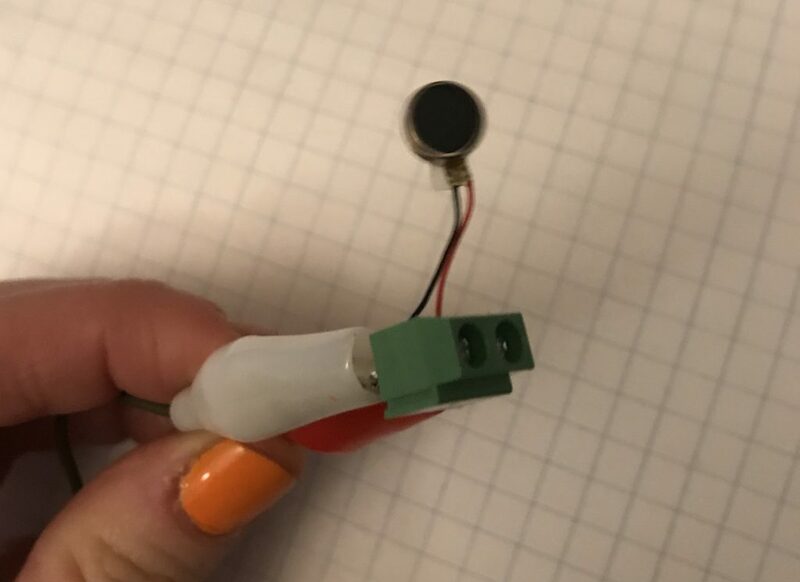 Sensor attached together with tape, and connected to the circuit with alligator clips. Sensor secured together with electrical tape to avoid any drips of water from the bottle. My next steps were to attach the sensor to the water bottle and take readings with different values of water. The water/pressure sensor beside a list of sensor readings that are taken in 100ml intervals. Sensor attached to the bottle. I found that there was not a significant range between 100ml intervals. This was an interesting challenge; I had initially planned to take readings on how much a user had sipped. The only major data differences were between 200ml intervals. 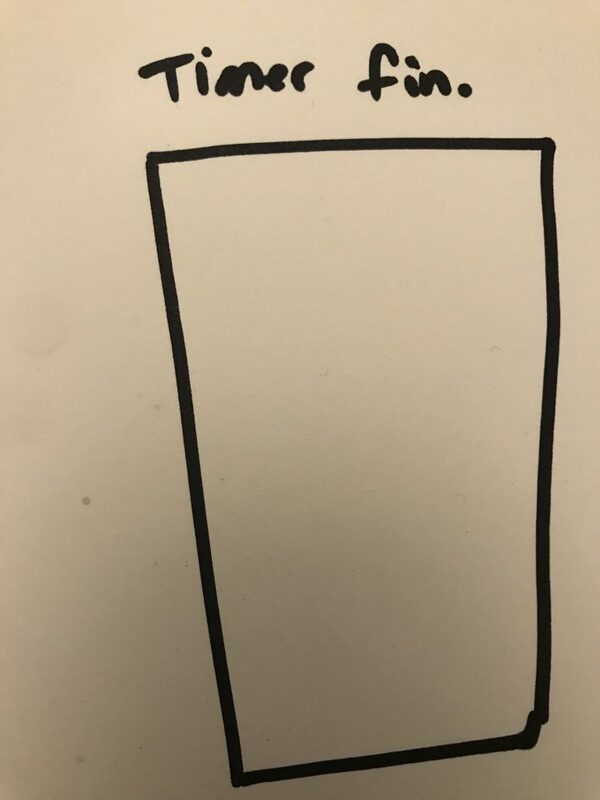 I found that this was an unrealistic amount for a person to drink in one sitting each time the bottle would prompt them to drink. Due to the data not providing a large enough range, I chose to include time as an indicator. If the bottle was “picked up” the sensor would not have any weight on it, therefore we could assume that the user would be drinking. The time the bottle was picked up would be timed to help ensure that the person was actually consuming. I wrote out my entire process before I started coding. The coding process written out to help understand the order in which to write the code. 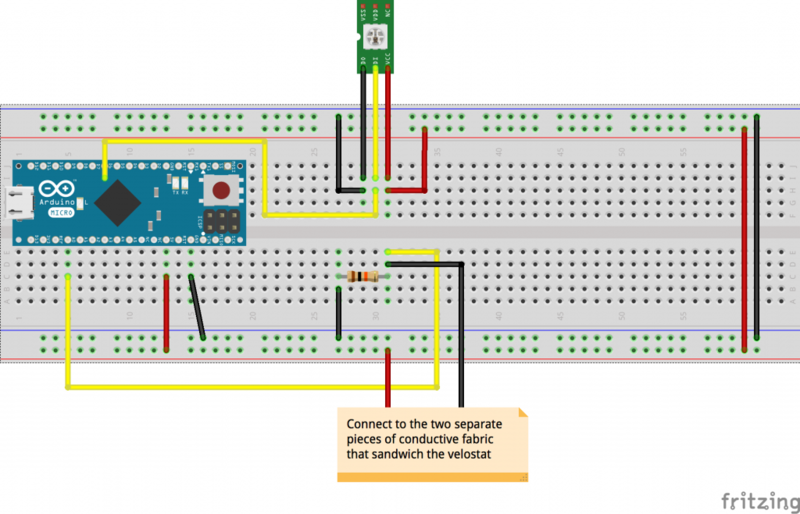 Fritzing diagram showing the LED and sensor connections. My first step was to ensure that the program would know that the bottle was being picked up to consume water. I tested this by using a strip of addressable LED lights as an actuator. If the bottle was unattended for more than 3 seconds, the LED lights would change to red. If the bottle was picked up the LED lights would change green. When the bottle was placed back down the timer would start again. My second step was to calibrate the values of the sensor. I wanted to incorporate the ability to measure how much water was in the bottle after the bottle was picked up. 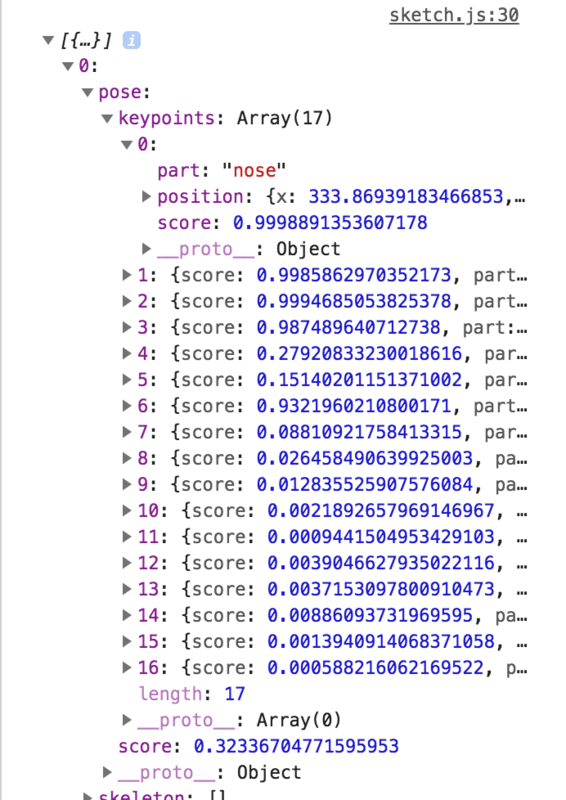 For the first five seconds of the code, the sensor would calibrate. I coded the rest of the program based off of these calibrated values. If, when prompted with a red LED light, the bottle was picked up for more than three seconds, placed down, and the sensor value was lower than the original calibrated sensor it would register that the person drank enough water. Otherwise, the LED light would stay red indicating that the water consumption quotient was not satisfied. The functionality of this aspect was difficult to achieve. The results of recalibrating the sensor were inefficient. I attempted to pour out more water in an attempt to create a drastic difference in sensor values, but the values were still so minor in comparison. I chose to stick with the minimal viable functionality of lifting the water bottle up when prompted with the LED light and placing it back down again after three seconds as an indication that I drank enough water. Overall, I found this project challenging as the different sensors that I perceived to all be the same were actually drastically different. It was helpful, though, to figure out the intricacies of the sensor by creating a datasheet, as I had for the different millimetres. This whole process creates a relationship between you and the sensor and ultimately becomes an intimate experience. The sensor was crafted by your own hand and the sensor has its own unique data set. In the future, I think I would choose to use a tilt sensor to indicate if the act of water is being consumed. 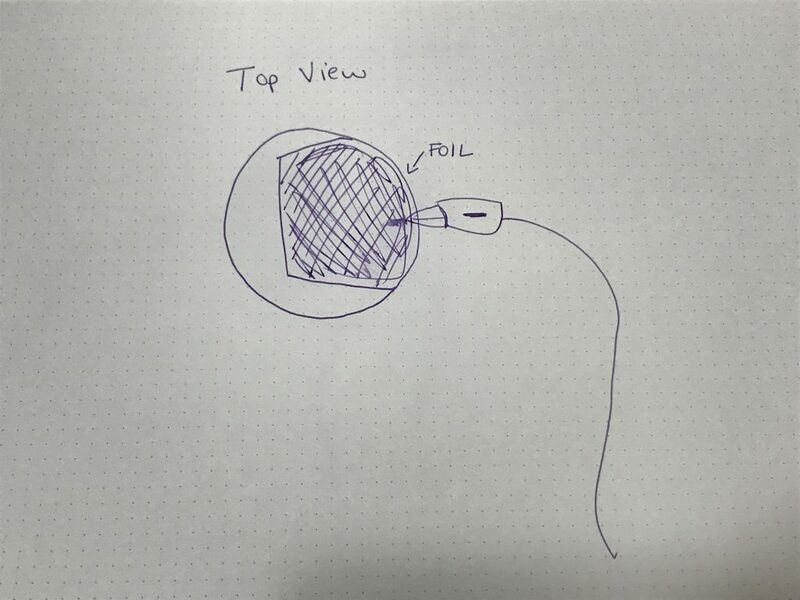 I think that having the tilt sensor connect with two pieces of perpendicular conductive fabric would achieve that same concept, without the finicky aspect of the data set. Even though the data set was much smaller than I had expected and less sensitive to the difference in the volume of water, I was surprised by how responsive the sensors were to light touches. 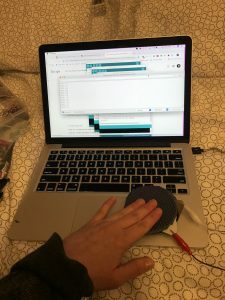 When I was initially testing my readings for the water bottle, I could get a nice varying set of data by drumming my fingers along the top of the sensor. 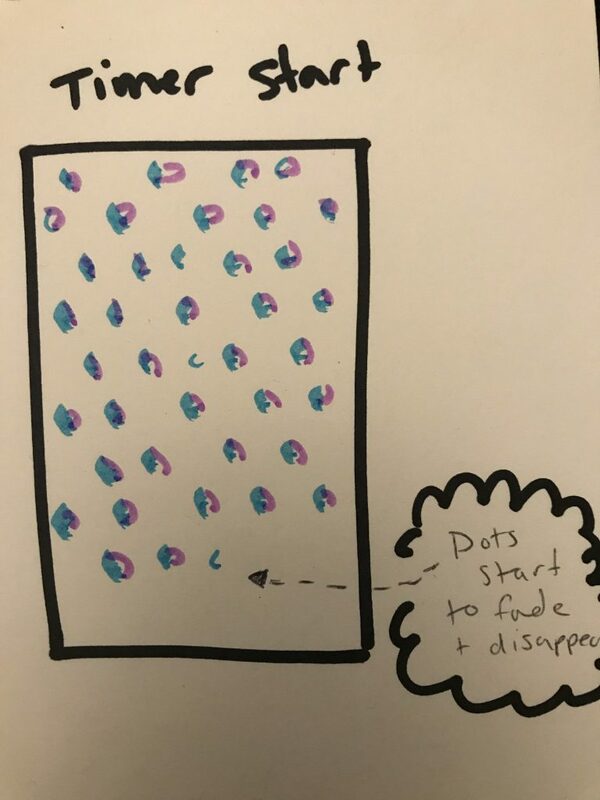 This could be applied in many different sound-based or visualization works. 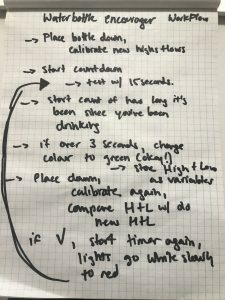 Overall, the sensor I crafted allowed me to create a bespoke drinking experience: a bottle that responded through LED feedback to the frequency of intervals you were consuming water, and for the timed length you were in the act of drinking water. My prompt for this project was to create a run adorably sock-. I knew that initially I would not be able to fabricate an entire sock. Instead, to start, I wanted to create an interactive attachment that could be placed onto a sock. The attachment would be activated by the press of the user’s heel down onto the ground in order to track the wearer’s running movement. 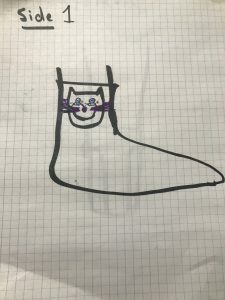 For the adverb side of the experiment, I wanted to create a cute cat face on the outside of the ankle that would light up when the button was pressed. Both together would create a bespoke attachment that lets the sock wearer run adorably. From the experiments in class, I chose two different techniques. First, the knitted button and second felting and conductive fibres. The knitted button made the most sense to me as I essentially wanted an open circuit that closed when the heel pressed down. I chose the felting for the sturdiness of the material. 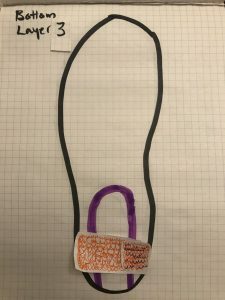 If this was a device that was placed on the bottom of the foot, I needed the circuit to be sturdy and bound securely into the attachment material. 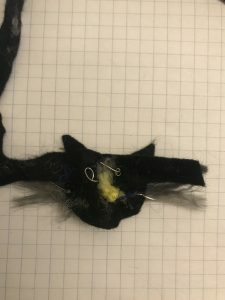 I chose to execute the “adorably” part of the prompt by using un-felted fibres as the whiskers of the cat to connect the circuit. 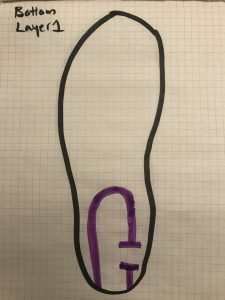 My original idea was to create a circuit that looped around the entire length of the foot, along the sole to the top of the foot and back past the heel. 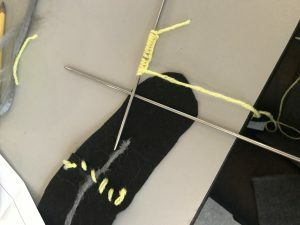 I initially traced my entire foot onto felt, but as I started to felt my fibres into the material I realized I had not fully thought through the connections. Looping around the entire foot would use a lot of excess material that was not required. 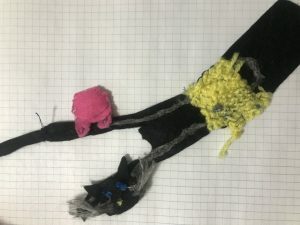 Upon this realization, I took apart the felted fibres from the foot and drew some more thorough diagrams of my connections. Figure 2: Full sole of the foot with the start of the circuit felted through to the tops of the toes. 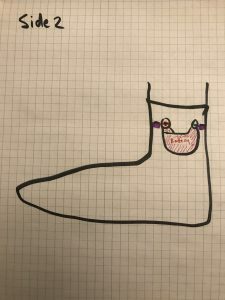 I diagramed my connections to wrap around the heel and ankle of the foot. I then crafted paper sensors to understand how I needed to attach all of my sensors together. Figure 4: Bottom view of the sock, layer 2 showing the first piece of knitted material. Figure 5: Bottom view of the sock, layer 3 showing the first piece of knitted material with conductive thread. 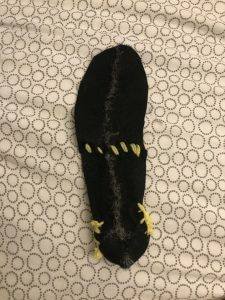 Figure 6: Heel/Back view of the sock, showing felted circuit. 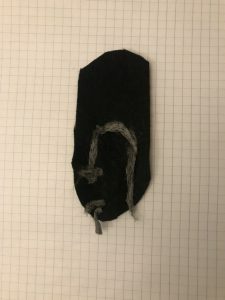 Figure 8: Side 2 showing the battery attached to the sock. The only part that I had less certainty about were both of the LED lights for the cat eyes. I chose to experiment and include them in this experimentation for my own personal research. As I took apart the fibres on my first iteration of the full sole. I noticed that there were lots of stray fibres poking through. I was going to reuse that specific piece of felt but I was unsure if the stray fibres would contaminate my new circuit. Figure 9: The back side of my initial iteration with lots of small fibres spread throughout the piece of felt. I started to tear the fibres into pieces and then felt into the new heel attachment following my circuit diagram. The button would complete the gap in the circuit. The felted perpendicular lines were designed to give more surface area for the button to touch. Figure 10: Felted the circuit to only the heel of the attachment. I took a break from felting and knitted my button sensors. I was excited that they were able to work just by pressing the pieces together. 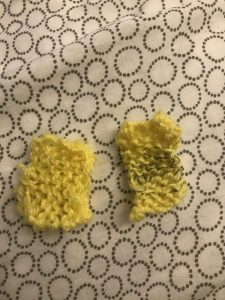 In my design, I did not need three knitted pieces, but rather two. 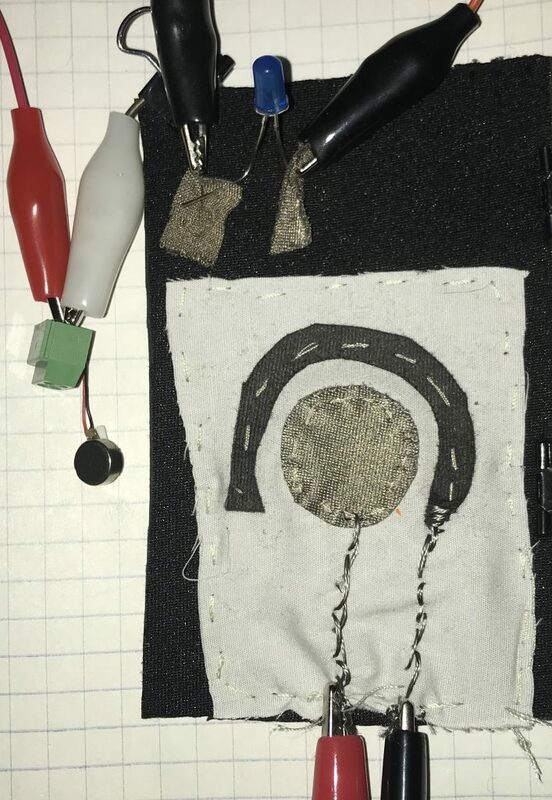 I was going to use the felted circuit as the connecting part for the button. As I was knitting the conductive thread into the piece, I left gaps at the top and bottom of the knitted square because I wanted to be cautious of shorting my circuit. 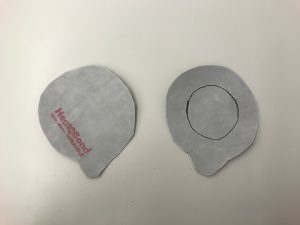 I was aware that the space on the heel I had allotted for the button was small and I did not want to have any risk of the button connecting to the other side of the heel circuit. 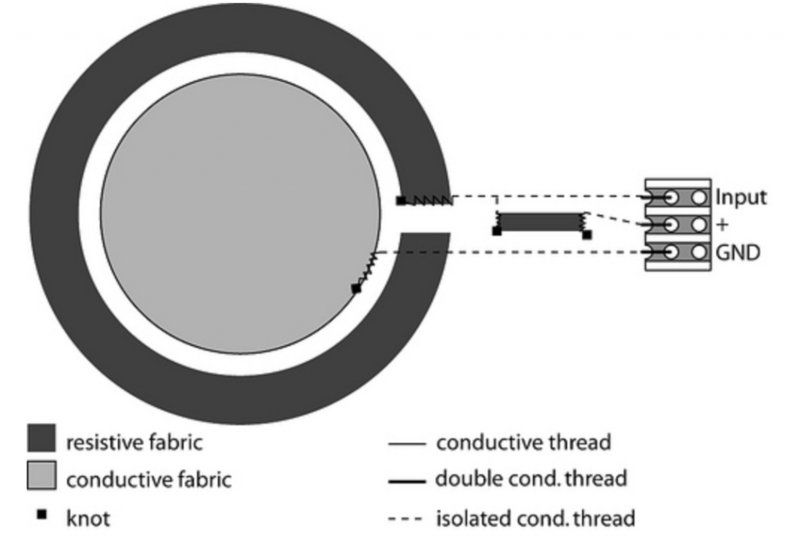 Figure 11: Two knitted pieces for the button; the first without conductive thread and the second with. I tested the button using my testing tool to ensure that my loops were large enough for the knitted in the conductive thread on the first piece. To my surprise and contentment, it worked. I went back to felting and making the adorable cat with LED eyes. This process was challenging and frustrating. I had felt a piece of material in between the eyes to allow the first LED to end and the second LED to begin. Using the conductive fibres was challenging for this part; I had chosen them as the connections for the LEDs because I thought there would be a thick enough base for the wires of be able to stick into. I had also thought that I would be able to felt over top of the connecting part of the LEDs to secure the connection. In the end, I only was able to make the first LED light up briefly and could not confidently repeat the result. Figure 12: The connections in the back of my cat were close together making for a messy circuit. I attached the cat face to the circuit and tested it using my testing tool. I was able to get satisfactory results of using the whiskers to “brush” along the felted circuit to pass the current through. I then sewed my knitted button onto my circuit. This I found challenging as I was not getting the bright consistent results I had with my testing tool. I placed my testing tool on either side of the button and was getting dim results. The electricity was passing through, but my connection was not strong enough. I believe this was due to my design of the large gap. 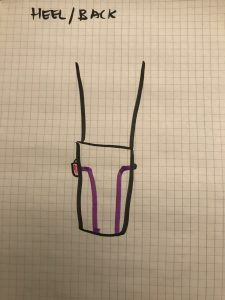 In a future iteration, I would need to sew the knitted piece that contained the conductive thread to the circuit to enforce a stronger connection. Video 3: Testing the knitted button sewn into the circuit. The end result: my piece could be clipped to the base of the foot and to the ankle to act as a sock that helps someone run adorably. This assignment felt very similar to my first encounters with jumper wires and a breadboard. The first time I was following along in Creation and Computation my circuits were not colour coded or organized. As I was going through that assignment, I was thinking about how in the future I would be much more intentional with my stitches and keeping a clean working space. This is reflected in the way I aim to set up my circuits now; I am very intentional with ensuring I can see everything that is happening. I found the best example of frustration caused by straying from this technique when felting the fibres. Initially, I was felting away not really considering how the fibres on the other end would interact. As I started testing, I consistently went back and ensured that my working space was clean. This was a huge hassle and in the future I would use felt to block out certain parts of the felting area to ensure a contamination free zone. I also re-learned the importance of sketching out my circuit and pursuing the project with intention. I think the connotations of the materials lends itself to a crafting mindset. It is hard to re-wire those instinctual urges such as; I will cut away the felt; or, I can use glue to repair that later. What helped the most was making my components out of paper first and then laying them down to understand my prototype. 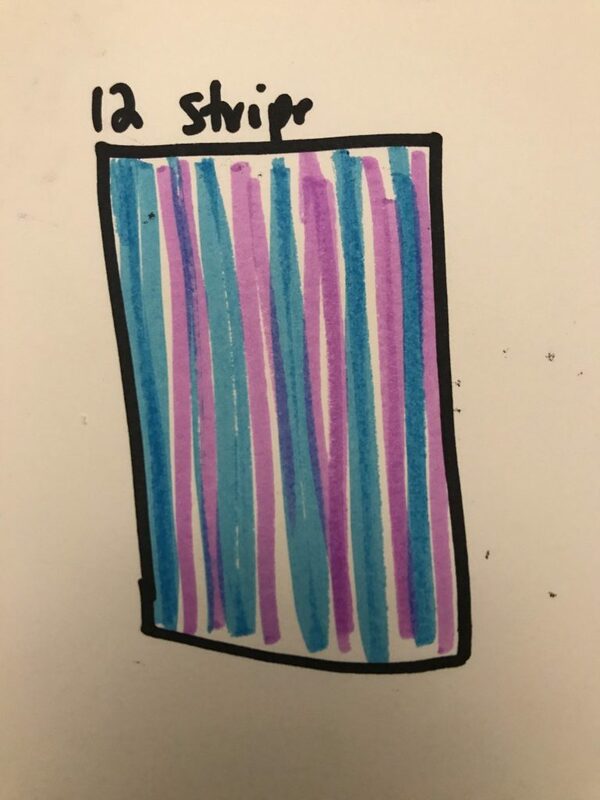 This allowed me to consider dimensions, connections, and what materials I would need to use. 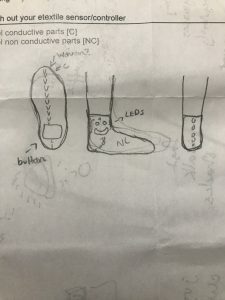 Through my development, I found myself asking the question: “how would one actually wear this?” rather than “how would one construct this?” My first concern was about construction, but as I was developing the circuit I found myself placing the attachment on my foot and rethinking my design for wearable use. In my next project, I think this will be one of the questions in the forefront of my mind: how do I include the body aspect rather than just focus on the functionality? I followed the tutorials that were offered in the class: the knitting tutorial and the felting tutorial for constructing my circuits. I looked at the website How to Get What You Want to view some LED light attachments for inspiration but I chose to experiment with connecting to straight into the felted fibres instead. Include buttonholes and a sock to attach the piece together. 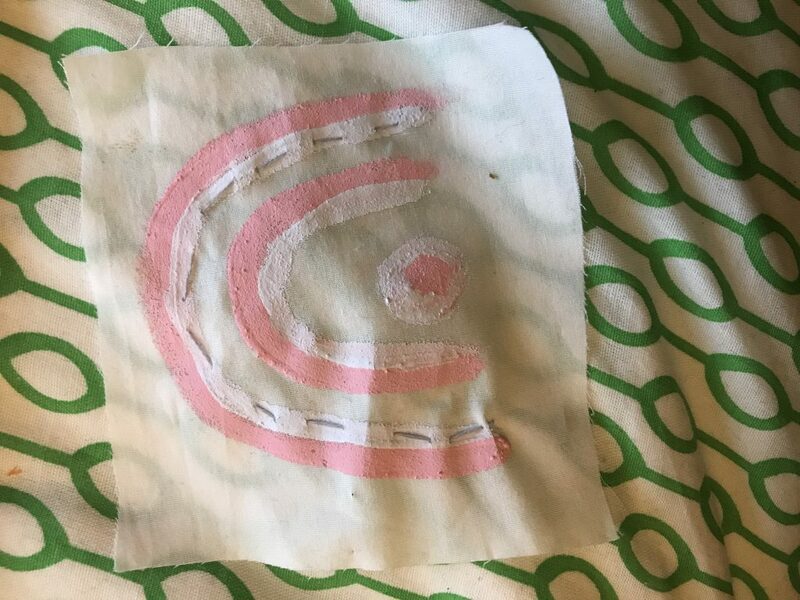 Consider using conductive fabric or thread to construct the circuit rather than felting, as felting is messy in narrow spaces. One could knit an entire sock with this circuit in it, rather than making an attachment. Fully attach a battery to the circuit rather than a quick stitch for security. Make a matching pair for the sock.